Welcome to the MINIATURE CRANKIE FEST! The scrolls range in size from 3/8" to five inches high. 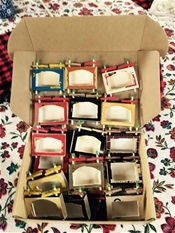 The crankie boxes are made from cardboard, wood or tin. There is one example from the 19th century from the collection of Professor Erkki Huhtamo. 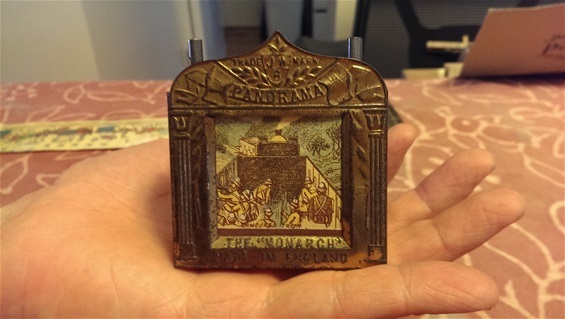 For more examples of 19th century toy or souvenir moving panoramas visit these pages: SMALL MOVING PANORAMAS and THE COLLECTION OF ERKKI HUHTAMO. "War in South Africa" a toy moving panorama made in England 1899 (trademark J.W.R.). The beautifully ornate box is metal. The paper scroll is about 2" high and the spindles are metal. From the collection of Professor Erkki Huhtamo. This is the back of "The War in South Africa". Extremely rare, possibly only two survive. No video available because it was too fragile to crank but grateful to Erkki Huhtamo for sharing pictures with us. 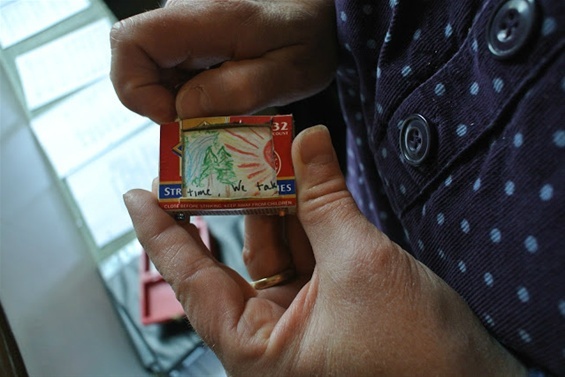 Inspired by the matchbox crankie made by Susan Reid of VT, I crafted this little gift for Scottish Gaelic singer/musician Naomi Harvey in 2012. She took it home to Scotland and her band Lurach put music to it - love it! Ellen Gozion from North Carolina made this crankie in a bit over one hour. She covered a cardboard beer box with nice paper and used paper towel tubes for spindles. The scroll is paper with crayons and paint. So sweet! 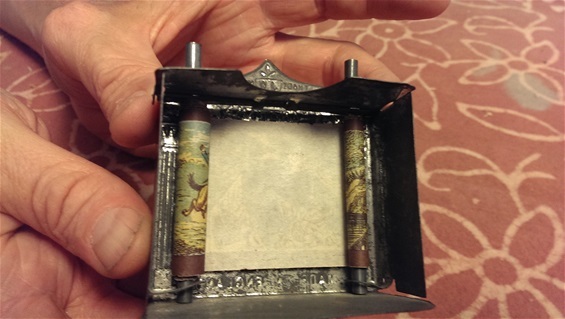 This match box crankie was made by Susan Reid from Vermont. The picture came from Anna and Elizabeth's Crankie Girls blog in 2011. This is where I got the idea to make match box crankies. Some day I will get to meet Susan Reid to thank her! Tony Mates of Seattle made this sweet and very useful crankie from an Altoid tin. It includes a map of the Bay area! My husband, Richard Twomey, made this really tiny crankie for me for Christmas, 2018. What a surprise. The scroll is 3/8" high and made from tissue paper. This scroll is a draft, I am experimenting with different materials. It is so small that one needs a special camera lens to film it!